Former Shorecrest, Shorewood, and King's basketball coach Marv Morris was inducted July 24, 2018 into the Washington Interscholastic Basketball Coaches Association Hall of Fame. Coach Morris tallied over 300 wins in 19 years as head coach at Shorecrest, King's and Shorewood. 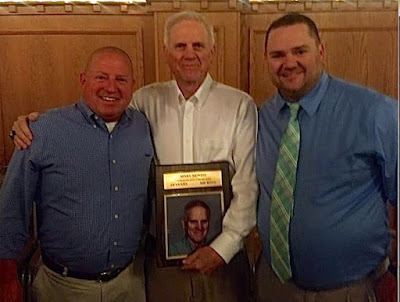 Washington Interscholastic Basketball Coaches Association (WIBCA) selected four coaches for induction to their Hall of Fame at their 43rd annual banquet. The celebration was held on Tuesday, July 24 at the Nile Country Club in Mountlake Terrace and celebrated three coaches: Marv Morris (King’s, Shorewood, Shorecrest), Nalin Sood (Mountlake Terrace) and Larry Walker (Lewis and Clark High School, Everett CC). Hal Williams, longtime assistant coach at Tenino High School, was inducted as an assistant coach. Mel Moore received the Ed Pepple Service Award for his work and support for the State tournaments in Yakima. The Pat Fitterer “You Gotta Love It” Award for his positive contribution to coaching was given to Nick Brown (Arlington).